Tis the season to celebrate and give back to our community. Join us for a very special evening of great food, live music, silent auction and holiday spirit. 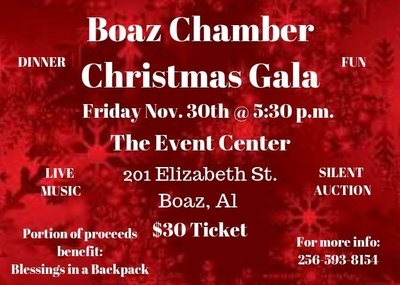 Please contact the Chamber office at 256-593-8154 or click on the REGISTER NOW button above if you would like to get a ticket, a table of 10 or SPONSOR the event. If you are interested in providing a Silent Auction item, please call us at 256-593-8154. Every donation makes a difference! A portion of the proceeds from this event will be donated to Blessings in a Backpack to help make the holidays more joyous for area children. Sponsorships are available from $500 - $1,000. Contact the Chamber at 256-593-8154 for more details.